Select the basic settings for the document or photo you want to print. Note: The print window may look different, depending on the version of OS X and the application you are using. Select the Copies and Pages settings as necessary. Note: If you do not see these settings in the print window, check for them in your application before printing. 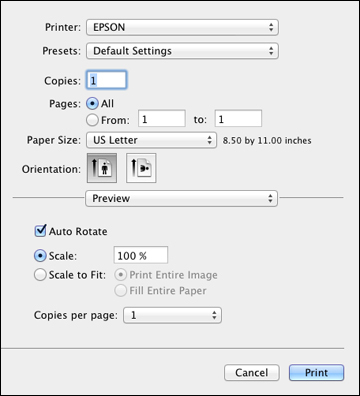 Select the page setup options: Paper Size and Orientation. 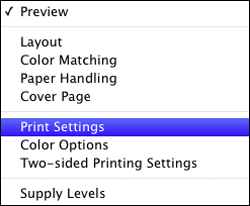 Note: If you do not see these settings in the print window, check for them in your application before printing. They may be accessible by selecting Page Setup from the File menu. Select any application-specific settings that appear on the screen, such as those shown in the image above for the Preview application. Select the Paper Source you wish to print from. 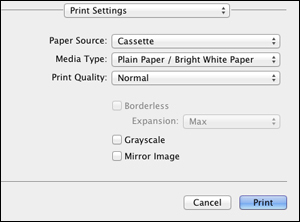 Select the type of paper you loaded as the Media Type setting. Note: The setting may not exactly match the name of your paper. Check the paper type settings list for details. Select the Print Quality setting you want to use. Select any of the available print options.